The thing that surprised me most about the crime novels I read was how structurally interesting they were. That wasn’t true for all of them, of course. A lot of them had the structure where the first third is given over to the slow lead-up to some crime, the second third is given over to increasingly frantic–but seemingly successful–efforts to escape punishment, and the last third is where the complex tissue of lies and evasions finally falls apart. That was the basic structure of Double Indemnity, The Postman Always Rings Twice, The Killer Inside Me, and Pop. 1280. And there’s nothing wrong with that. All of those books were really good. But some of these books had structures that really surprised me. Normally, I’d think that a structure was interesting when it played with my expectations. But I’m not sure what my expectations for the structure of the crime story were. I knew that they weren’t detective novels, so I wasn’t expecting any kind of mystery or procedural elements (although sometimes, particularly in Jim Thompson and James Cain’s novels, those elements were present). I guess that my expectations had to do with pacing. I that novels this short would have a very tense and frenetic pacing. Mostly that was not true. Most of the novels had slow bits, usually at the lead-in, but often in the middle stretch, too. They took their time, and meandered around the setting, and often wrapped things up suddenly, in just the last ten pages or so. Without exception (I think), none of them dwelled very much on the crime itself. Sometimes the crime took place inside a scene break. Sometimes it was glossed over in a few lines. A lot of them gave over large portions of their short length to internal ruminations, or to setting up lengthy hypotheticals. And some of them went in directions that surprised me: story structures that felt like nothing else I’d ever read. The most notable of these was Kenneth Fearing’s The Big Clock. This story is told from about five different points of view, but fundamentally it’s about the editor of a large true-crime magazine in NYC. He witnesses a murder and wants to keep his own role secret. However, circumstances eventually require him–in his professional capacity–to search for the witness to this murder: himself. From that point on, the novel experiences a sort of doubling. He’s forced to investigate himself, while the murderer is also using him to try to find the witness. At one point, there’s even a tripling, when the novel dips into the viewpoint of an anecdotally involved female painter for one really bravura chapter. It’s hard to describe (especially without spoiling the book), but it was a truly fascinating performance. Then there was William Lindsay Gresham’s Nightmare Alley, which is basically about a carnival magician turned psychic and then religious con-artist. It’s sort of a cross between Sinclair Lewis’ Elmer Gantry and every movie you’ve ever seen about grim, inhuman carnivals. It’s kind of a picaresque adventure, but the book has a sort of nested structure, where chapters at the end start to revisit the themes of corresponding chapters at the beginning. This is another one of those books is only a crime novel because it was written by a crime writer. And finally there was Cornell Woolrich’s I Married A Dead Man. The novel begins with a startling twist (which I definitely did not see coming) and it ends with an equally startling one. I can’t talk about either one without, most likely, depriving you of the joy you’d get from reading this book, but the structural choices necessitated by these twists were very interesting. Both shortly after beginning and shortly before ending there is a substantial drop in tension in this novel, in a way that wouldn’t work in most novels, but works very well here. 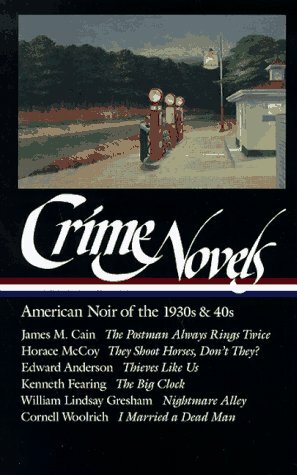 All three of these examples are from the Library of America compilation Crime Novels: American Noir of the 1930s and 40s. Although I often found the stories in this book to be less tense and well-written than the other, I think I was on the whole more interested by them than I was in any other crime novels I read. The worst of them was, for me, the novel Thieves Like Us which was about a crew of bank robbers, but even this one was structurally interesting. It wasn’t much concerned with the robberies themselves, but with the long stretches of peace, tedium, and suspense between the robberies. However, I found structural surprises elsewhere, too. 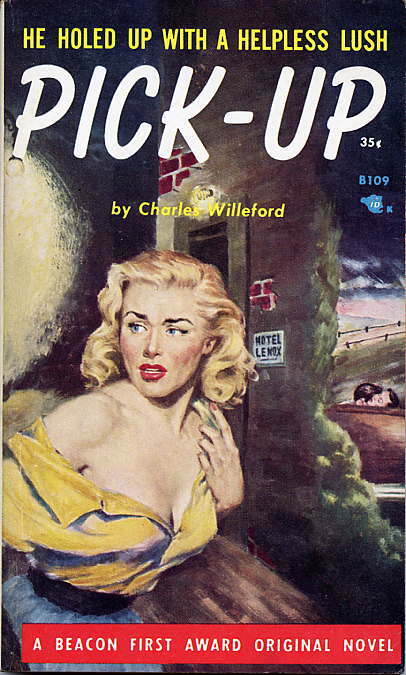 For instance, in Charles Willeford’s novels, the crime tends to take place in the last third of the novel. I think this makes for some very surprising effects, especially in his 1955 novel The Pick-Up. Most of this novel is given over to the crazy binge that its hero goes on with a girl he’s just met. He starts off as just another hard-drinking counterman and then goes on a ride that was so raw and shabby and strangely believable that by the end of the novel you fully sympathize with the desperation that drives the hero to do monstrous things.